The vow ‘till death do us part’ is no longer a defining feature of the average European marriage. Whilst divorce is common across Europe, actual divorce rates vary significantly between countries. 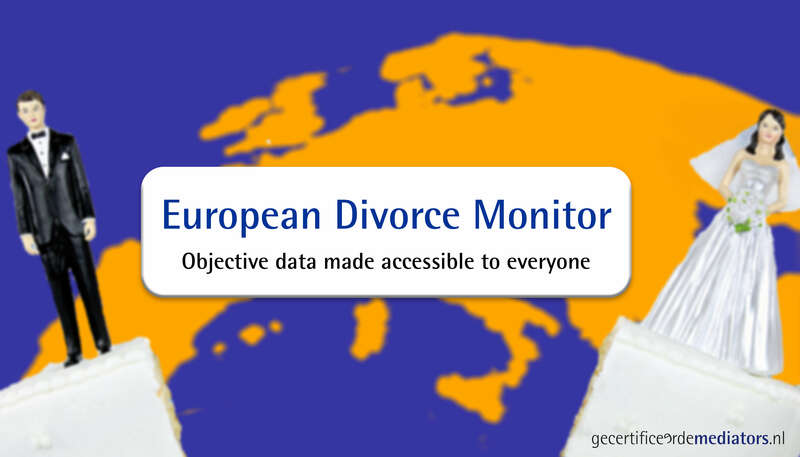 The Dutch national mediation service Gecertificeerde Mediators (Certified Mediators) has analysed European trends in divorce based on data provided by Eurostat and the United Nations. The map below shows the divorce rate in European countries per 100 marriages. On average, the European divorce comes down to to 39 (2016). Portugal is the country with the highest number of divorces filed per 100 marriages (69), followed by Luxembourg (65,9), and Ukraine (57,7). In contrast, divorce rates are much lower in Kosovo (6,9), Malta (12,2), and Macedonia (15). The analysis shows that 72,3% of all European marriages that ended in divorce, have lasted less than twenty years. 40,7% of all dissolved marriages lasted less than 10 years, and 0,43% less than a year. The average duration of a marriage at the time of divorce, varies greatly among European countries. Mediterranean Cyprus has the highest percentage of “flash divorces” in Europe (marriages lasting under one year): 3,8%. In neighbouring Turkey, 1,1% of all marriages end prior to the one-year mark. Lithuania ranks 3rd in this dubious list with 0,9% divorcing within 1 year of marriage. In comparison, there are 7 European countries where the number of marriages that failed within less than 12 months following the wedding is negligible. Most notably, these include: The UK, Germany and Norway. However, the vast majority of European couples file for divorce after a much longer period of being married. In Malta, for example, no less than half of all divorces occur after a marriage lasting 20 years or more. This rate is also high in Italy (42,0%) and Slovenia (37,1%). Underaged offsprings are directly affected in the majority of divorces in Europe (56,3%). In Portugal, this percentage is significantly higher (70,5%) whereas the percentage of divorces directly affecting children in Italy is below the European average (37,1%). Europe’s highest divorce rate for families with at least three underaged children can be found In Finland (15,3%). The bottom place of this particular list is, again, taken by Italy with a mere 0,9%. The European average is 6,3%. Disclaimer: For this research most recent European data was used. Crude divorce rate (Eurostat), average length of marriage (UN), Children involved in divorce (UN).